This is what chocolate looks like before it’s ground and made into bars. This is cacao, dried and cracked open to reveal the dark richness inside. We saw these particular beans at a Maya farmer’s home in Belize, just before the holidays. 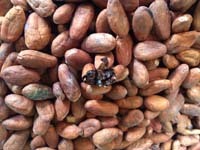 There, we witnessed the enormous labor involved in growing, harvesting and preparing cacao. And we learned just how tough it is for farmers to make money at this job (one farmer estimated he could earn roughly $600-$800 a year farming 12 acres of cacao). Today, The Guardian reports on the grim future of chocolate, and the need for a new business model that does more to help the (largely rural) (often impoverished) farmers who grow cacao. Just a small fraction of the money paid on chocolate typically trickles down to the farmer. That’s why many of the Maya villagers we met hope one day to work for a bean-to-bar system in which they grow the cacao—and they also make the chocolate bars. Otherwise, they say, too many middlemen get between their hard labor and profits. Development work is complicated. Ask anyone with experience in it. Take, for example, this New York Times story about African fishers taking their bed nets to the waterways. These nets, distributed by the millions in efforts to prevent malaria, were intended to keep families safe from nighttime mosquito bites. But villagers, driven by hunger, have found the nets to be highly effective—and cheap—alternatives to fishing nets. This, in turn, has raised concerns about the toxicity of the nets (they’re treated with insecticides) and the effects of dragging them through communal waters. Scientists also worry about the catch: tightly woven mosquito nets capture more and smaller aquatic creatures than traditional fishing nets do. All of this is prime example of the unintended consequences that unfortunately plague so many development projects worldwide. I love think pieces. As it happens, pure coincidence, last week I chose to listen to a Radiolab episode on the origins of disease just as I was taking an oral typhoid vaccination booster—a week-long, 4-pill regimen. The episode, Patient Zero (updated segment) starts with the fascinating story of Typhoid Mary, a carrier of this disease who never developed symptoms. But she was a cook, and she unknowingly spread the illness to many, many people through food. We don’t hear much about typhoid in the United States; it’s nasty stuff, rooted in the bacterium Salmonella Typhi. A couple of friends have had it in recent years and were lucky to survive. And so, just as I was thinking about this, and the ways in which illnesses live and breed and spread through us as victims or hosts, I found myself listening to Patient Zero. The show takes us from typhoid to HIV to Ebola, in the search for origins. Who was the first person to contract each disease? How? Why? And can we ever really discover the beginning? Often—not always, but often—answers are found in food: what we and our fellow members of the kingdom Animalia consume. Just as President Obama gave his State of the Union speech this week, two critical New York Times stories have highlighted the abysmal status of our food (a subject not included in Obama’s address). Viewed from so many angles, it just looks bad. As Mark Bittman writes, more than 46.5 million Americans are receiving SNAP benefits (formerly food stamps). That’s some 15 percent of the nation. His commentary outlines how the most pressing issues facing Americans are stitched together in a complicated web. And food is center. Meanwhile, this scathing report by Michael Moss details the horrendous conditions animals endure at a federal research center in Nebraska. In this must-read investigation, Joseph Sorrentino documents the dangerous conditions that workers—often undocumented—face in New Mexico’s Big Dairy industry. We often hear of undercover investigations that show animal abuse in large-scale operations; not often enough do we see stories on the workers, who risk life and limb for minimal pay, no breaks, no overtime and fear on the job. More fodder for the argument that “local” is not always “better” when it comes to sourcing food. Every winter when I visit my parents in Wisconsin, I sit at the kitchen table and watch dozens of wild turkeys parading through the backyard. It’s hard to imagine a time without that iconic bird. But, as The Dodo reports, an eternal open season on turkeys nearly led to their demise. It took biologists and innovation to bring them back. More here.